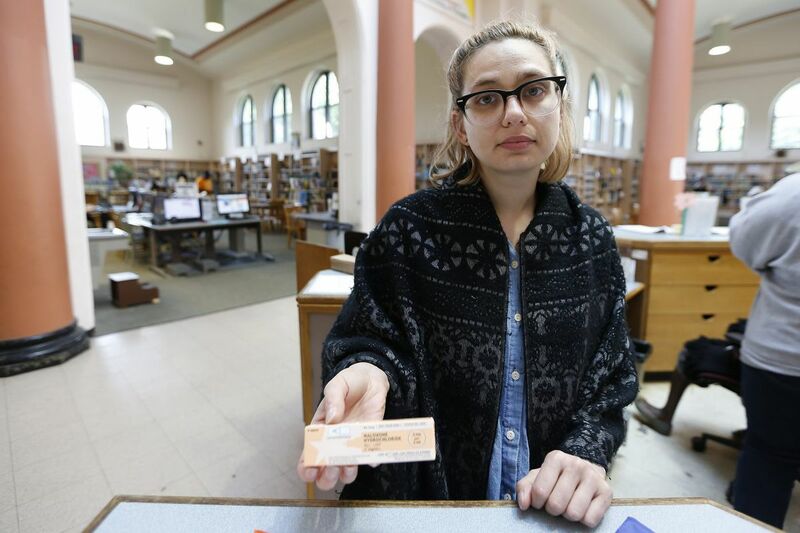 Chera Kowalski, who works at McPherson Square library, poses with naloxone inside the facility on a day last year when she had to use the reversal drug on a person who overdosed on heroin. Even in the digital era, libraries are high-traffic zones, hosting more than 1.5 billion visits annually. On any given day in Philadelphia, the Free Library welcomes a stream of visitors, who arrive early in the morning to use the computers, congregate after school for homework help, and join a rich range of programs, from story time, to job fairs, to classes for English language learners at the Culinary Literacy Center. Here and across the country, public libraries offer vitally important free and public spaces in our communities—advancing education, literacy, social connection, and wellbeing. Libraries are also unlikely heroes in addressing the opioid epidemic, whether or not they intend to be. In Pennsylvania, 12 percent of the state's public libraries experienced a drug overdose on-site in the past year, according to a recent study from our team at the University of Pennsylvania. Those numbers may continue to rise. Philadelphia recorded 1,200 overdose deaths in 2017—nearly twice the number from just three years prior. Across Pennsylvania, the drug overdose death rate more than doubled between 2010 and 2016, earning the state a hideous distinction as a leader in drug-related mortality. For some libraries, responding to overdoses has become a routine occurrence. Our team interviewed dozens of library staff during the Public Library Association annual meeting, held in Philadelphia this past March, to hear their concerns regarding the opioid crisis. We encountered librarians who were at turns angered, perplexed, saddened, and overwhelmed by the challenges of widespread opioid use and overdose in their communities. A small-town librarian from New Hampshire told us, with a dispirited sigh, that she had called the fire department three times in just the past week to respond to suspected drug overdoses. Some libraries have responded to the opioid crisis with remarkable ingenuity and resolve. This is true in Philadelphia's hard-hit neighborhoods, where branches of the Free Library have garnered praise for their efforts to recognize and reverse overdoses using the life-saving drug, naloxone (brand name Narcan). In a busy Colorado library, staff members encounter a person injecting drugs at least once a day. There, the team works to balance the health and social needs of people actively injecting drugs, while also aiming to keep the library as welcoming and safe as possible for patrons of all ages and life experiences. Similarly, a librarian from West Virginia described the thorny challenges that resulted from a recent overdose at her facility. She explained that it was both frightening and sad, and that "the children that were in the library. They came upstairs and they watched it. And so, the parents of those children are very active on social media. Well, now you get known as the drug house. And that doesn't benefit anybody." Few librarians enter the profession with the expectation that they will be called to provide emergency medical aid to patrons. But in today's reality, library staff must be prepared. They need further training to understand and respond to the needs of patrons with substance use disorder, including those at risk of overdose. Library staff need naloxone close at hand, and, importantly, a willingness to intervene. With these assets, library staff can and will save lives while on the job. Still, this is an understandably daunting prospect for people who expected to provide health information rather than acute health interventions. Inspired by organizations like Prevention Point, a national leader in opioid harm reduction efforts, our Healthy Library Initiative has partnered with the Philadelphia Department of Public Health on overdose awareness and reversal trainings at the Free Library of Philadelphia. We also trained staff from libraries across the country at the Public Library Association annual meeting. These efforts are small but important steps in confronting the opioid epidemic. Clearly, we have to do more. Librarians are already challenged to provide the research services, computer and internet access, educational support, programming, and warm welcome that make libraries such attractive community hubs. People suffering from substance use disorder need all of those supports, and more, to guide them toward health and recovery. They need vastly improved resources, including increased access to evidence-based treatment. Comprehensive User Engagement Sites (CUES), which include health and social services for people using injection drugs, can reduce overdose deaths and decrease disease transmission rates, including from HIV and hepatitis C. Importantly, CUES can also serve as conduits to treatment. By providing integrated care and safe places for people using injection drugs, CUES may alleviate some of the burden currently carried by public libraries. As one librarian from West Virginia shared with us: "We have kids that are strung out on heroin. It's concerning to me because I don't want to be the place that they think they can come and [use drugs], but I'm not going to put them out and tell them they can't come and use the internet." This is a tragic dilemma that public libraries face every day, as they have become de facto injection sites in many communities. Libraries are not equipped to optimize the safety of people using opioids. They are not prepared to support the mental health of patrons who witness drug use or overdose. Nor are they trained to clean up potentially hazardous drugs and paraphernalia. Librarians cannot tackle this problem alone. It is time for public health and health care institutions, as well as social service providers, to partner with public libraries, sharing our strengths in order to alleviate the human suffering faced by communities nationwide, including our own. Carolyn C. Cannuscio, ScD, is Associate Professor of Family Medicine and Community Health, Perelman School of Medicine, and Director of Research, Center for Public Health Initiatives (CPHI), at the University of Pennsylvania. Roxanne Dupuis, MSPH is Research Program Manager at CPHI. Eliza D. Whiteman, PhD, is a researcher at Penn's Healthy Library Initiative.